At ATS Euromaster we offer a wide variety of tyre patterns suitable for a range of Honda vehicles. The tyres we provide for these models can be purchased online at competitive prices and fitted in one of the 330 centres we operate across the UK. It is also possible to arrange for our mobile tyre fitters to come to you and fit your new Honda tyres at a time and a place that suits you. 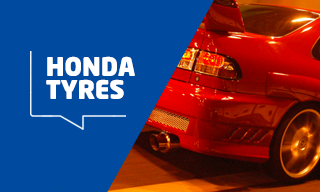 Honda has been working with tyre manufacturers all over the world for decades to create compounds that help motorists get the most out of their car. The patterns help to maximise the performance of the Japanese manufacturer's models in all weather and road conditions. Honda has partnered with Goodyear to produce the original equipment tyres fitted to the range of Civic models. There are other options available to Civic drivers, including Michelin's Pilot Sport 4, the Pirelli Cinturato P7 and the Avon ZZ5. The Honda Accord has been in production since 1976 and is one of the most popular models ever made by the Japanese manufacturer. The models come factory fitted with Bridgestone Potenza tyres, but there are a wide range of other options for motorists keen to get the most out of their Accord. Goodyear's Eagle F1 Asymmetric 2 tyres are recommended for the model, due to their combination of Active CornerGrip and Racing compound technologies and the major step forward they provide in terms of safety. The manufacturer has increased the contact area with the ground and the uniform distribution of pressure means that this can be maintained even at high speeds. The Honda Jazz is one of the top super-minis on the market at the moment due to its fuel efficiency and high performance in urban environments. To get the best out of the car, the Michelin Energy Saver pattern is fitted as standard. The asymmetric tread pattern and textured spines mean the tyres offer the best grip in their class on both wet and dry roads. However, there are a number of other tyres that can be fitted to the vehicles as an alternative, such as the Michelin Pilot Sport 4 or the Dunlop SP Sport Fast Response.